A good way to start building that library, and exploring and experiencing the rich and influential world of Irish writing - one of the nation’s great gifts to itself and the world - is to read a new book from Galway bookseller Des Kenny, entitled Kenny’s Choice - 101 Irish Books You Must Read. Kenny’s Choice is Des’ personal selection of Irish fiction, poetry, and history books he feels are too important not to read, have been overlooked or neglected, or are worth rediscovering. 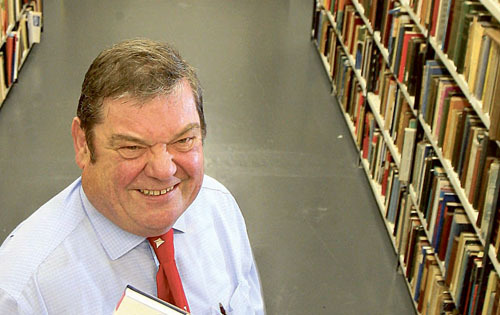 For this Des drew on his love of books as well as his knowledge as a leading Irish bookseller. Kenny’s Choice will be officially launched tomorrow at 6pm in Kenny’s Bookshop, Liosbán Industrial Estate, Tuam Road, by the broadcaster and author John Quinn. The launch will also mark the official re-opening of Kenny’s Bookshop in its new location in Liosbán. The book features 101 reviews - some written as Gaeilge - with author information. Each review is only two pages in length and written in an accessible manner, yet still manages to yield a wealth of information - always the mark of a good critic. In short, it’s the kind of book you can pick up to check on one review and end up reading for ages, coming back to dip in and out of every now and again. Major Irish writers such as John Banville, Seamus Heaney, Jennifer Johnston, Brian Moore, William Trevor, Samuel Beckett, and WB Yeats are included. Co Galway authors are well represented through Walter Macken, Pádraic Ó Conaire, Brendán Ó hEithir, Ken Bruen, Máirtín Ó Cadhain, Liam O’Flaherty, and Tom Murphy. While the above are obvious inclusions, Des also wanted to champion writers whose work has suffered neglect or marginalisation over the last few decades and to convince people to read them again. It’s a welcome and fresh perspective for such a book to adopt and it is good to see Christy Moore and Pat Ingoldsby included alongside more obvious writers like JM Synge and Frank O’Connor. Many may consider Des’ inclusion of Maeve Binchy’s Light A Penny Candle odd though. However the most surprising thing about Kenny’s Choice is not an inclusion but an omission. James Joyce is nowhere to be seen on Des’ list of essential books. Des has reasons both practical and provocative for leaving him off the list. He points out that most people are well aware of Joyce, aware of his reputation, and can name a number of his books even if they have not read them. “This book is not about Joyce, it’s about the other men and women who deserve attention,” he says. Des also says, somewhat mischviously, that there was little point including Joyce as “most people claim to have read him”. It is a fascinating aspect of the James Joyce phenomenon that no criticism is permitted of the writer and those who dare suggest - no matter how well versed they are in Joyce or their academic qualifications - that Ulysses has any flaws, suffers an immediate ‘belt of the crozier’ from the Joyceans. Des’ third point is bound to send them through the roof. Des describes writing the book as “an extraordinary journey” which he greatly enjoyed. Kenny’s Choice - 101 Irish Books You Must Read is published by Currach Press and is available for €35 (hardback ) and €19.99 (paperback ). Page generated in 0.1856 seconds.